We interrupt our Legoland posts for a quick travel update! Today Oliver and I travelled from Aarhus to Amsterdam via Copenhagen. This involved one bus ride, two flights and one train ride. It took about 6.5 hours. Oliver is becoming quite the seasoned traveller and, so long as I tell him each of the travel elements to expect for the day, he does not complain (although he is not looking forward to the long flights back to Sydney on Sunday). Amsterdam seems crazy busy after the peaceful lane ways of Aarhus. The streets here are a profusion of trams and cars and motorbikes and bikes and pedestrians. So. Many. Bikes!!! I thought Aarhus had a lot of bike riders but Amsterdam is Aarhus X 1000. Bikes going everywhere. It makes total sense for the environment but it makes walking the streets precarious. And no one wears helmets. Not even little kids biked around by their parents. I love bike riding but I suspect riding here in Amsterdam would give me a heart attack! No photos unfortunately because I feared being run over if we stopped to click. Oliver and I emerged this afternoon from our comfy hotel room (check out tomorrow is at noon; bliss!) for a quick scout around. Amsterdam reminds me of London during my first one or two visits; when I didn't know or understand the city; couldn't find my way around; didn't know its secrets. I think it takes a local to help you feel comfortable in cities like London, Amsterdam and perhaps Sydney. I really love London. I'm not intimidated by it. But Amsterdam felt intimidating this afternoon, not knowing where to go or what to see. And so crowded. We needed a local or a visiting “old hand”. 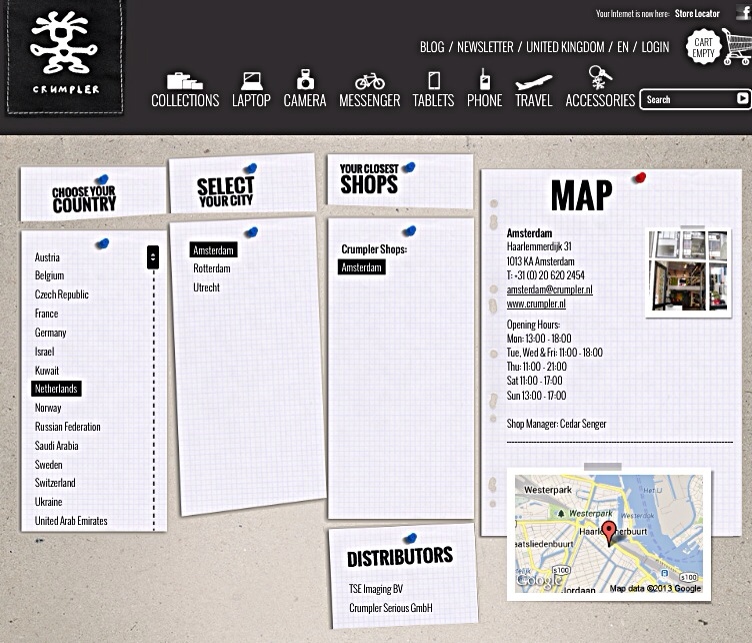 Instead we followed a map on my iPhone to the Amsterdam Crumpler Store. I planned this visit before we left Sydney! As some of you know, I love Crumpler bags and they sell entirely different ones here in Europe. 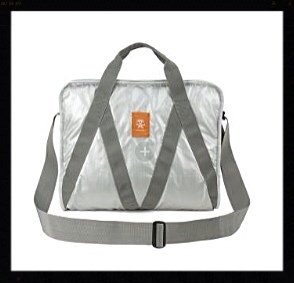 I found out this afternoon that this is because Australian Crumpler sold their European business to a German company. The German company has kept the same logo, general styling and design philosophy but produced a different range of bags. Awesome! The man in the store was super friendly and gave me a couple of sample cases (apparently they've been celebrating their birthday) and some Crumpler shopping bags. I picked up a few gifts for friends, a cool silver carry on bag for me (since Oliver and my bags are pretty full) and a funky little Crumpler man key ring. The store had so many wonderful bags, cases, notebooks and other stuff to chose from. Tomorrow we catch the train to Rotterdam for the start of three and a half intensive days of conferencing, starting at 2.30pm with one of my three remaining spoken talks (the 5 minute one). Onwards!! This entry was posted in Airports, Buses, In Aarhus, In Amsterdam, In transit, Out and about, Packing, Planes, Trains on June 26, 2013 by Amanda Barnier. Thanks Bronwyn! Thanks for reading along with us. I’ve got some more pictures of Legoland to post in the morning. Then we’ll be up to date! When I get home I’m going to get the blog turned into a book for Oliver; for a keepsake. I’m glad I’ve kept it up as a reminder for him of what we did together! We loved reading about your adventure so far. It looks awesome!!! Logan looooved Legoland. He couldn’t believe it as it looked so real.